I came across an article the other day from the ‘Boston Globe’ talking about the increasing difficulty of making new discoveries. I discovered (no pun intended) that until recently no one has really tried to measure the increasing difficulty of discovery. The name given to this new type of research is called ‘scientometrics’. Once upon a time, it seems like discovering brand new things/theories/places was really simple. Article after article was published by brainy people across a broad range of fields containing discoveries that were breath taking and, in many cases, awe inspiring (how to travel faster than the speed of sound, the invention of the cochlear implant, VOIP technology). The reality was it only took creativity, some time and the ability to ask the right questions to come up with a new discovery. For example, the author of the Boston Globe article reminds us that Galileo rolled objects down hills. Robert Hooke played with a spring to learn about elasticity. Isaac Newton poked around his eye with a darning needle to understand colour perception (and yes, you did read that right). Now days it would seem this is a thing of the past. No simple rubber band game on a Monday afternoon. We need a massive team numbering in the thousands and an atom smasher which costs more than GDP of many smaller countries on this earth. You can see why governments and large companies are keen to learn as much as possible about ‘scientometrics’ even if it is just to see the best (and by best I mean most economical) way of making scientific discoveries. Surprisingly, even in the early days of discoveries the very beginnings of ‘scientometrics’ can be seen. People recorded the number of yearly articles published about insights. Some study regarding monetary grants has shown the average age of scientists who receive grants from the National Institutes of Health has increased and the younger scientists have been given less. The young guns are missing out! Mmmm… perhaps we should employ some ‘scientometrics’ to Christendom. Do we really give the ‘kiddies’ a chance? When was the last time churches really risked a LOT (including money) on someone who perhaps was not yet proven? I’m not suggesting we forget the character of a person. But I am suggesting that we show some trust in who the person could become. My denomination has introduced a new scheme for Professional Personal Development. Something which I support… Something I am even willing to pay for… But here is the thing. The process grates. For example, the default position is that those who have been in ministry for more years than you can count MUST get with the program. Seriously, if you have been in ministry for so long and you aren’t involved in some sort of professional personal development, then I would suggest you stopped being a good leader many years ago. They’re the good guys. I think what may happen with the “not-so-good” guys might be even more scary. The rumblings have it that men who have been in ministry for a certain number of years will be matched up with young leaders to mentor them. Hmmmm. It’s ok if the older leaders are good mentors, good leaders and whole-hearted followers of Christ, but what if they’re not? If, regardless of leadership ability or character, the older leaders mentor the young leaders because, ‘We have been in ministry for such a long period of time, we have the answers, we can, no we should, mentor all the newbies’, we should shoot this horse now. Perhaps for the future of the denomination we should match some of those kind of older leaders up with some of the young guns – not so the young fellas can learn from them, but rather, that they could follow the young leaders around for some time, walk with them and see what they can teach their elders! Now moving on… hobby horse has been shot… In ‘scientometrics’ a term has been identified as the ‘exponential decay’. 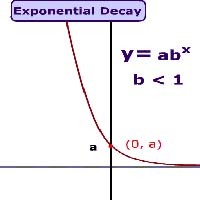 The exponential decay is a curve that illustrates the ease or lack thereof of each discovery every year. Interestingly, the curve shows the ease of discovery doesn’t stop by the same amount every year, but rather it declines by the same fraction each year. For example the discovered asteroids get 2.5 percent smaller each year. What this shows is that while the ease of discovery drops off quickly as early researchers pick the more obvious discoveries, it can continue to ‘decay’ for a long period of time. It gradually gets harder without anything actually becoming impossible. In other words, while discovery can become extremely difficult, it does not mean that it stops. But the key thing is it does reveal what kind of resources we may need to continue to discover things. To counteract the force of exponential decay and maintain discovery at the current pace, researchers will need effort that meets an exponential increase. So as we discover smaller and smaller particles, or slightly heavier chemical elements, you can’t just expend a bit more effort. Sometimes you have to expend much, much more. How many of us have experienced the same sort of ‘exponential decay’ with churches? I am reminded of a chapter from a book by Erwin McManus regarding a condition known as atrophy… a wasting away from lack of use. I have seen some real keen evangelists have tremendous success within churches, leading people who have been church goers for years to Christ. Most of these evangelists have been our more traditional ‘proclaimers’. God bless these people! They devote themselves to the cause. And as a result they pay a price… a price many of us are not willing to pay. Some of those proclaimers have lost to a degree the ability to reach an increasingly isolated-from-the-church and cynical Aussie. In recent years a new breed of evangelist has emerged who has discovered a “new” way of influencing people and making culture different. This group of people has little regard for the atrophy suffered in the local church and devote themselves to ministry largely outside the established status quo. These people have very little desire to be part of anything that focuses on the needs and wants of the “saved” over the needs and wants of those still outside the Kingdom. In my mind these people are the ones we need to be spending our time and money on. We should not only be spending time and money of them, but we need to expand our resources in order of magnitude to counter the exponential decay. Scientometrics in the church. Who would have thought? !